The Whitefish Bulldogs scooped up a fumble on the opening kickoff to fire up their bench and look to get off to a better start after two tough opening season losses. 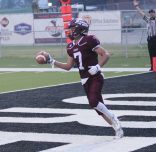 That was as good as it would get for the Bulldogs Friday evening as the Butte Central Maroons forced a quick punt and scored on their next six offensive possessions, and one of Whitefish’s, in route to a 49-7 rout in Class A non-conference action on the Bob Green Field. Longtime Butte Central Head Coach Don Peoples Jr. was pleased with the overall result but sounds ready to get back to work this week at practice. 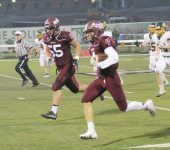 The Maroons added a defensive touchdown as for the second straight week an underclassman came up with an interception return. This time it was Thomas McGree doing the honors as Central came up with big plays from up and down their roster. Junior quarterback Cade Holter was lethal with both his arm and legs, connecting on eight of ten passes on the evening, all in the first half. His best was likely his last as he found Clay Fisher on the final play of the first half for a 35-yard touchdown that sent the teams to the locker room with the Maroons leading 42-0. Central averaged almost 10 yards per rush in the first half as senior Ryan Moodry busted off his share of big runs to join Holter and Fisher to carry 18 times for 174 yards. Holter found five different receivers in the first two quarters for 157 more yards as the Maroons outgained the Bulldogs 331-15 in the first two frames. The second half saw the Maroons give some underclassmen some run as McGree saw some snaps at quarterback before giving way to Ian Williams. 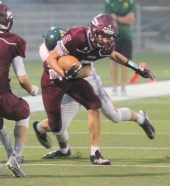 Sophomore Nate Boyle showed that the Maroons have yet another promising running back who is more than capable of making plays as he carried the rock five times for 36 yards against the Whitefish varsity, who stayed in until they finally punched in a late touchdown. The Maroons looked poised to open the game with a big kick return but a great tackle dislodged the ball and Devin Beale jumped on top of it to give Whitefish possession at the BC 47. That was as good as it would get for the visitors. The Bulldogs started Chad Queen at quarterback instead of their usual senior Forrest Kolbet, who would lead the offense starting with the first snap of the second quarter. Queen was greeted by Fisher, who sacked him on third and 10 for a big 13 yard loss after the fumble recovery and forced Whitefish to punt. 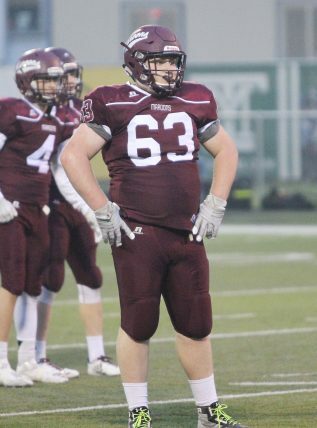 The Maroon offense clicked immediately as Fisher, Holter and Moodry all gashed the Bulldog defense for big runs to get the Maroons into the red zone. The drive appeared destined to bog down as a false start, two short runs and an incompletion had the Maroons looking at 4th and long at the Whitefish 21. Holter dropped back and threw a perfect pass to Fisher, who was streaking past the only defender near him on the left side, for the touchdown to give Central a 7-0 lead at the midway point of the first. The play opened the flood gates that resulted in 42 points being scored in 18 minutes of game time. Another three and out on the next Bulldog drive was highlighted by a Zeb Antonioli sack, setting up the Maroon offense again. Holter ripped off an 18 yard run to get the drive going, Fisher and Moodry both added some rushing yards. Moodry hauled in a 9 yard screen pass setting up a 20 yard touchdown pass to McGree and a 14-0 Maroon lead with just over a minute left in the first. Early in the second Whitefish finally gained their initial first down and seemed to have something going as Kolbet was using some power running out of the wildcat formation to put together some positive yards. He dropped back to pass on a first down play inside Maroon territory and was unable to get the ball away cleanly as the Central pass rush tipped the ball. McGree was able to break on it and catch it already running the other direction and would outrace the Bulldog offense for a 71 yard pick-six making it 21-0 with 90 seconds gone in the second quarter. Central’s defense wouldn’t wait long to get the ball back as on the second play of the next series Whitefish tried a reverse. The Maroons weren’t even close to being fooled as several defenders beat the would-be ball carrier to the second hand off and knocked the ball free. Junior Seth Gardner came out of the pile with the ball and the Maroons were back in business on the Whitefish 34-yard line. It would only take four plays as Moodry and Holter gained all the yards, first on a 6-yard catch by Moodry followed by his 14-yard run. Holter kept the next two, the first one for eight and the second appeared to be a pass play that broke down, but the junior QB showed his moxie by eluding the pass rush and scrambling six yards for the score, giving Central a 28-0 lead with just under eight minutes left in the second. The score was the Maroons’ third touchdown in less than five minutes of game time. Whitefish’s frustrations continued on their next drive. While the Bulldogs didn’t turn the ball back over their three plays netted only one yard before another punt. The Maroons got a couple new names on the score sheet on the ensuing possession. Allen Boyle caught a 19-yard pass to overcome a first and 15 after a false start. A couple plays later, Matt Simkins hauled in a 19-yard reception of his own. Fisher and Moodry runs would set up Holter’s next athletic romp through the Whitefish defense, this time a 21 yard effort that saw him drag a few Bulldogs into the end zone. Moodry connected on his fifth extra point to set the running clock into motion with Central up 35-0. Whitefish committed its third turnover of the night, this time on a lobbed pass Aiden Petritz outjumped the Whitefish receiver for his second pick in two games. The Maroons didn’t have much time to get anything going with the clock running. Holter connected with Simkins for the second time, this one going for 28 yards and Central spent its last timeout with :05.6 showing on the scoreboard clock. Central again found a way to get the speedy Fisher isolated in a one to one matchup on an island against a Whitefish cornerback. Holter threw a ball that allowed Fisher to adjust and he reached out laying on the turf just before the ball hit the ground after the clock already had expired for the Maroons’ sixth touchdown of the first half. The Maroon starters got most of the briskly flowing second half off. Moodry did step in to get the short touchdown run from three yards out on Central’s only drive in the third quarter. Fisher got things started with a 34-yard run. Nate Boyle carried three straight times for 25 yards and Moodry punched it in from five yards out. McGree was inserted into the drive but was happy to let his running backs handle the heavy lifting on the drive. The fourth quarter saw Central’s freshman get into the game as Ian Williams got his first snaps at quarterback, and Egan Lester had his first rush after his pick six last week at Ronan. Whitefish finally was able to get a scoring drive put together the second to last time they touched it. Kolbet was able to run it in from three yards out with 3:47 left on the running clock against the Maroon underclassmen to end the scoring with the home team ahead 49-7. 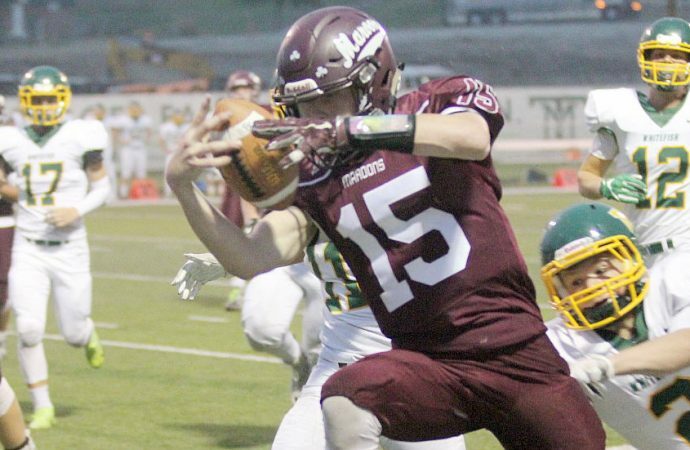 The Maroons racked up more than 400 yards of total offense while limiting the Bulldogs to 115, more than half of which came on their late touchdown drive. “I thought our defense played really well overall,” Peoples said. The Bulldogs only completed two passes on the evening for 15 yards, which was a combination of tight coverage and the defensive line giving Whitefish no time to find anyone open. The Maroons won the turnover battle for the second straight week, three to one tonight as they had a pair of interceptions and a fumble recovery, all leading to touchdowns. Holter was precise with his passing, connection at an 80 percent clip for 157 yards. The Maroons did not attempt a pass in the second half. The three heading rushing monster was led by Fisher with 75 yards, Moodry and Holter were right behind with 70 and 69 respectively. Boyle came on in the second half to add 36 yards on five totes. “Our running backs, Nathan, Moods and Fish all ran hard,” Peoples said of his three rushers. Fisher also paced the Maroons’ receiving attack with 56 yards on a pair of long plays to push his total yardage output over 130 on the evening. Simkins added two for 47. McGree had the one touchdown grab for 20 yards, Allen Boyle added a grab for 19 and Moodry caught 2 for 15. “I thought our receivers did a good job catching the ball and I thought our offensive line did a great job too tonight,” praised Peoples about the rest of his offense. Central will celebrate Homecoming next Friday night when they play host to the Libby Loggers, the Maroons’ second opponent that is returning to Class A this year. The game will be at 7 p.m. on the Bob Green Field. Central will then open its conference slate in two weeks against the defending champion Dillon Beavers in what should be a measuring stick game early in the season and go a long way toward setting up playoff seeding for the Southwestern Conference. Dillon knocked off Columbia Falls 16-14 Friday night. BC — Holter 21 yard touchdown run, (Moodry kick) 3:45, 35-0. Drive-6 plays 63 yards, 2:45. key play-Allen Boyle 19 yard reception on 1st and 15. BC — Moodry 5 yard run, (Moodry kick) 1:11, 49-0. Drive-7 plays 57 yards. key play-Fisther 34 yard run. Whitefish — Kolbet 3 yard run (Kolbet kick) 3:47 7-49. Drive-10 plays 69 yards 7:58 key play-Central defensive holding call negating Williams interception. RUSHING — BC (27-250), Fisher 6-74, Moodry 9-70, Holter 6-69, N. Boyle 5-36, Lester 1-3, Williams 1-(-2). Whitesfish (28-100), Kolbet 13-59, Ramsay 1-30, L. Schwaiger 9-27, Eisenbarth 3-6, Queen 2-(-22). PASSING — BC, Holter 8-10-0-157. Whitefish, Kolbet 1-5-2-12, Queen 1-3-0-3. RECEIVING — BC, Fisher 2-56, Simkins 2-47, McGree 1-20, A. Boyle 1-19, Moodry 2-15. Whitefish, J. Schwaiger 1-12, Anderson 1-3.